Even though we understand the economic and social causes of homelessness, the problem is still viewed as if it had caused itself, blaming the victim instead of looking at the bigger picture of who caused it in the first place. So that every time a suggestion is raised, there is some reason to shoot it down. Not In My Back Yard even though what authorities are currently doing, taking care of the ‘problem’ rather than looking for a solution, costs taxpayers more than the solution itself, which is government subsidized affordable housing. This type of political commentary, discussing the problem instead of the solution, is typical of a limited worldview. Looking at where the stick is pointing rather than who is holding the stick. The medium is the message and it seems people still haven’t got it even though the spell is rapidly wearing off and we are left wondering. What will replace it? Given the familiarity of the events that have led up to our current situation, we have to consider the possibility that there is no way of dealing with it other than how it should have been dealt with in the first place. 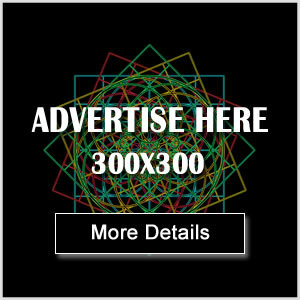 That in an effort to please everyone, the government, federal, provincial and municipal have pleased no one, while the corporations and large landowners have pleased only themselves. 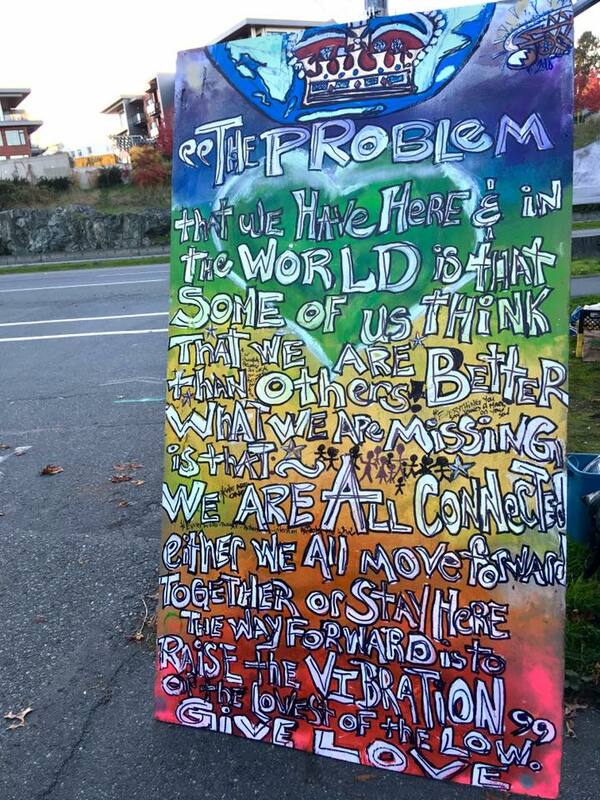 In 2016 it was Super InTent City, this year it is Camp Namegans, Salish for ‘We are all One’. Starting out as a prayer vigil in Regina Park for recently deceased homeless people, the camp quickly grew to a protest camp of 120 people. Their message and mandate evolving as reactions to the camp became more and more polarized. 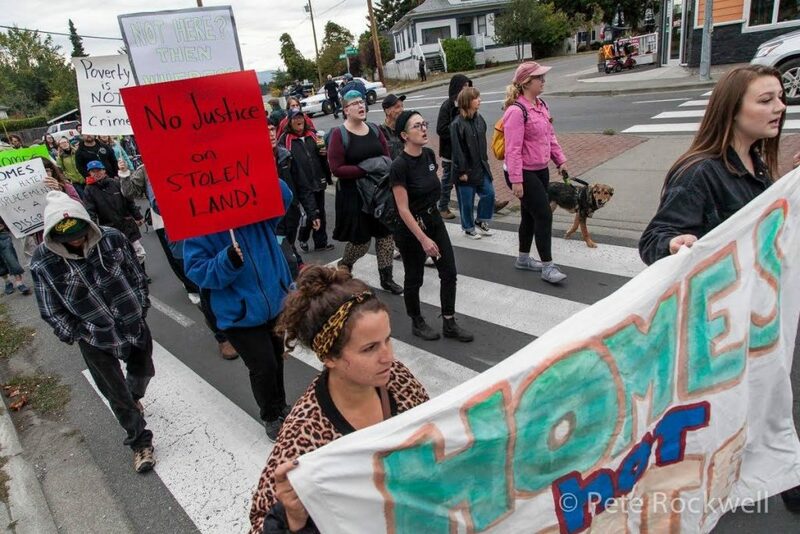 Settling, finally, on the slogan ‘nowhere to go’ after the five-month encampment was forced by court injunction to observe the 7 pm to 9 am Saanich bylaw for temporary overnight sheltering. The camp then proceeded to move en masse to nearby Rudd Park then a day later to Ravine Park, a traffic island on the corner of Carey Rd. and Ravine Way owned by the Department of Transportation. 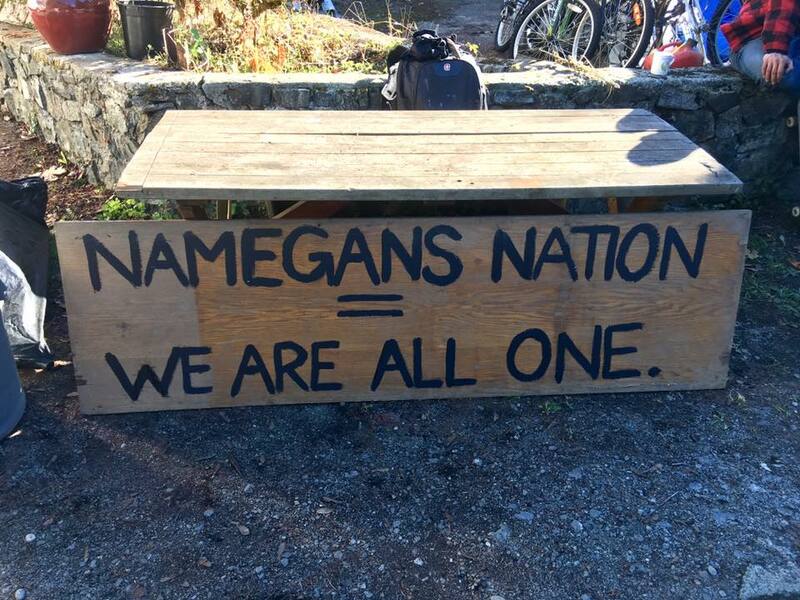 This move, from municipal to provincial land prompted campers to change their name to Namegans Nation, claiming the ‘first urban reserve in British Columbia’. 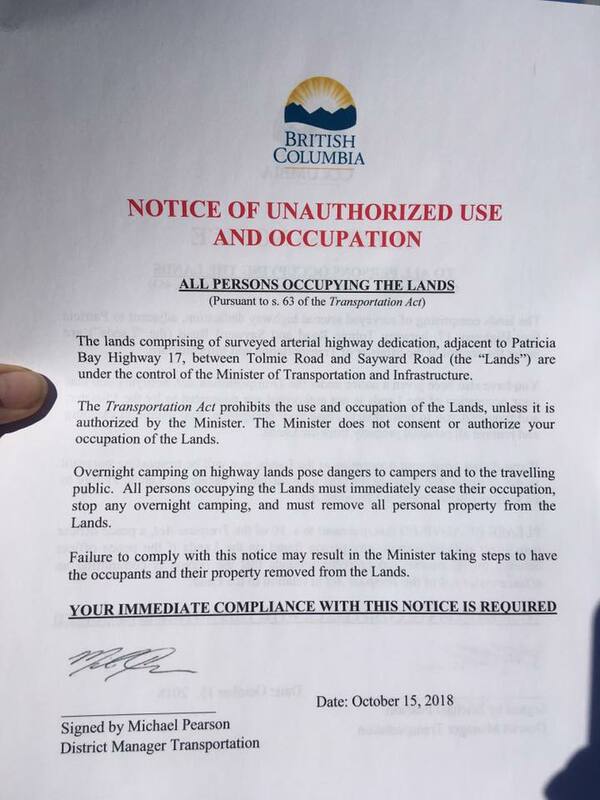 In a swift response, Saanich police issued a trespass notice on behalf of the Department of Transportation ordering the campers to vacate the property. 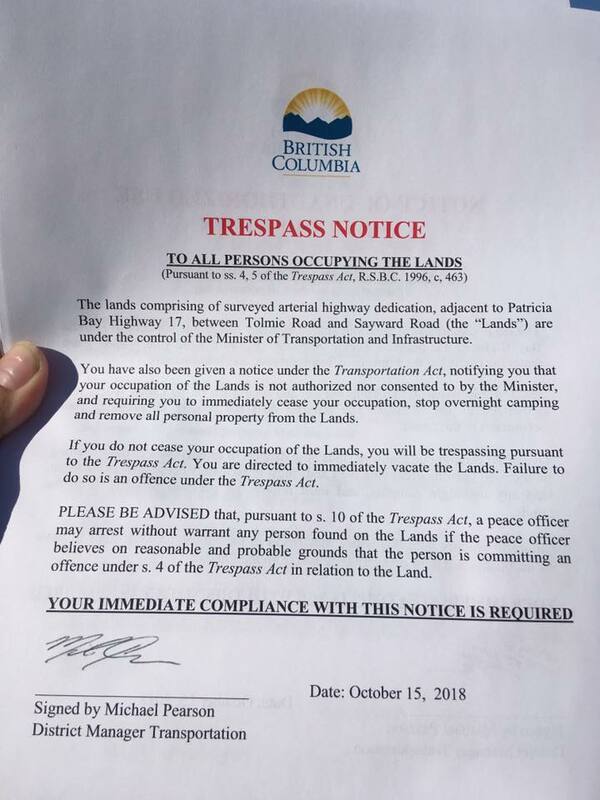 The notice was issued on the 15th of September and by the 18th Namegans Nation was evicted under the enforcement of Saanich police. A post on the camp’s Facebook page stated, “Displacing homeless people from one location to another using police force is not the solution. Housing is the solution. Tent cities exist because people have nowhere to go.” An altered version of the trespass notice was then drafted and returned to the Department of Transportation declaring the Camp a sovereign nation and instead of trespassing on the Province’s land, the Province was trespassing on theirs (Namegan Nation’s). Saanich mayor Richard Atwell in a statement issued after the decampment of Regina Park said, “the time for protest is over. Now it’s time to obey the law.” But it seems it is far from over. With 10 municipalities to go, the camp has carried its summer 2018 tour over into fall with its biggest appearance yet in Langford’s Goldstream Park. A great success considering the failures that were Rudd and Ravine, the Goldstream camp has managed to garner the support of the Ministry of Municipal Affairs and Housing, along with non-profit partners to open winter shelters a couple of months early and distribute rent supplements to people looking for housing in the private market. While Saanich, in a dramatic reversal has suddenly come up with a parcel of land just north of the fire/ police station that they are willing to develop into modular housing. While the sanitation stations/ bathrooms and storage lockers that were set up at the municipal hall in July have remained open. 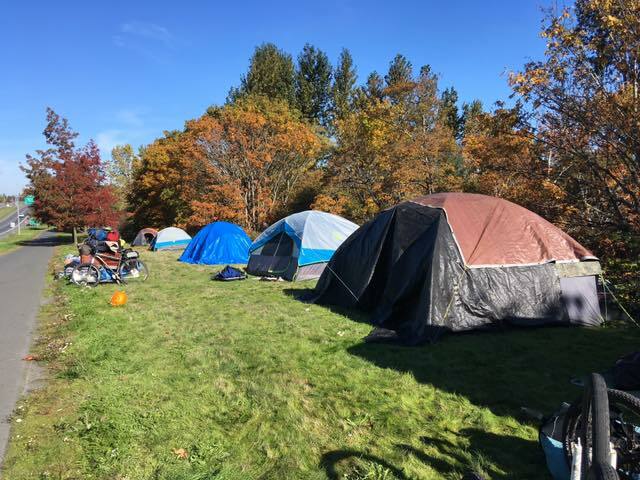 In their most recent incarnation, the camp has set itself up on private property along West Saanich road at the invitation of tenant and Saanich mayoral candidate David Shebib. But the owner of the property, Sam Seera, has expressed his opposition to the encampment. At first the campers and current occupants of the rental property had all been evicted, but Seera, falling for the charm of camp organizer Crissy Brett, has seen them as people rather than criminals. So what has made the Camp top of the news roster for several months has also made it difficult to evict. By now this fact has not been lost on camp organizers or the campers themselves. Many of whom know what it’s like advocating for one’s rights as a tenant and an as individual when faced with eviction. If it was hard for municipalities to evict them, imagine how hard it is for a private homeowner. The circumstances, almost intimidating in nature, confront one with a show of humanity that is hard to deny so all one can say is, “how can I help?” Which is exactly what he did, granting the campers another week (at least) to organize themselves, as well as a fleet of moving trucks and the ongoing, continued support of a would be Mayoral candidate and a bevy of social activists, who at one time or another have made the now infamous house, nicknamed the ‘Rent Ranch’ (yes the house already had a name), a month to month shelter for homeless and recovering addicts. It’s hard to say whether this latest move has been a success (for the campers). Rather it seems like a case of one step forward one step back, but it beats losing their community, which is after all, the only thing keeping their own individual stories from dying out, otherwise they would be pulling up a piece of floor or a cot in one of a handful of shelters. But more importantly, what the camp has taught us is that while it is easy to ignore an individual, it is harder to ignore a group made up of individuals. Even with the vitriol spouted at them from the public, the campers still seem to be holding their ground even when they have no ground of their own. This is my submission of ‘Namegans on the Run’ for The New Agora. 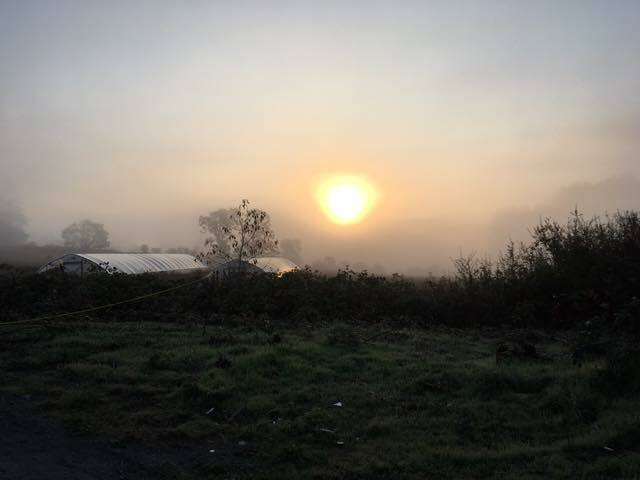 It is a brief article on the developments of the roving homeless camp ‘Namegans’ that has been on the move in the Capital region since May. The story has been and continues to be big news, the reasons for this I suspect are the same as those that make it so difficult to properly house or evict them from their encampments. I do not attempt to address all these reasons here, but I have done so in the larger feature of which this is just a part. Daniel is a graduate of Vancouver Island University’s Creative Writing program. 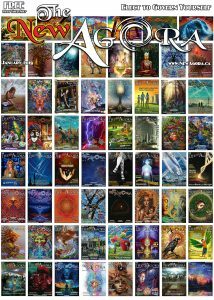 He is a reader and contributor to the Tongues of Fire reading series and has appeared in The Georgia Straight, The Birds We Piled Loosely, Clockwise Cat, Crack the Spine, Grey Sparrow and the Gyroscope Review. He has written several books (novels), all currently seeking publishers. He lives in Victoria, B.C.